Achieve elegance and style for your wine collection with custom kitchen wine storage designed for your kitchen remodel. Here are some of our favorite ideas that we have used throughout our Atlanta kitchen remodels! We can create clever and stylish wine storage ideas, including storage racks, wine coolers, and built-in wine cabinets. Pair a beverage cooler with stacks of cubbies to provide convenient storage for both types of wine you're likely to serve when you entertain. Reds, which should be served at room temperature, can rest in the cubbies. Whites or roses that you serve chilled can be stored at the perfect temperature in the wine cooler. These units come with racks so bottles can rest horizontally, which keeps the corks from drying out. Some models also have zoned temperature controls, so you can store sparkling wines at a lower temperature than whites or roses. If you serve wine often, consider investing in a full-size wine refrigerator. A unit like this one will keep wine at the proper constant temperature (between 40 and 65 degrees) and humidity (about 70 percent) so it ages well. Look for a refrigerator with temperature zones that let you fine-tune storage conditions. Tinted-glass doors let you see racks of bottles and block harmful UV rays that could affect the quality of the wine. 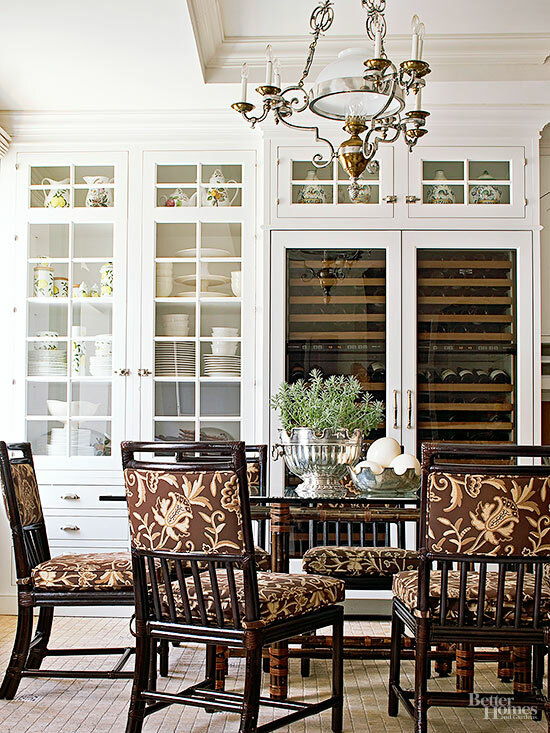 A row of cubbies tucked under the drawers in a custom-built work island stows a small supply of wine. This central location is convenient for serving, whether you're entertaining a crowd or just opening a bottle for dinner. Notches hold wine bottles in place on open shelves and ensure bottles don't bump into each other while in storage.